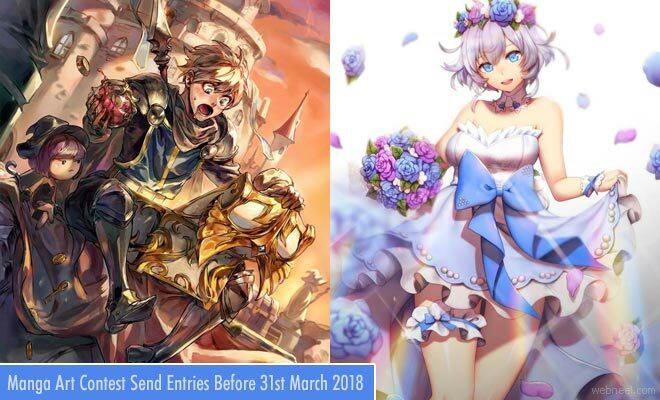 Manga Drawings : It's the 2nd Annual Awards for the Manga CPO and currently they are calling for entries till March 31st 2018. Mango CPO is owned by a non profit organization and with the collaboration of media partner MediaBang, they are working towards the popularity of manga. Illustrators, Graphic designers and Manga creators, it's time to show the world your creativity. There is no entry fees and it's open to all artists across the world regardless of age. According to MCPO Awards,"We think that the outstanding manga and illustrations that we have are like “content seeds” that will grow in connection with animation, games, and a variety of other media. The MCPO AWARD was created to find the next generation of creators and produce new “content seeds”. There are two parts for the contest: Manga and Illustration. Manga: Choose your own theme. Detailed short story not exceeding 30 pages and they should be fully completed. Illustration: Choose your own theme. File formats can be in PNG or JPG and the file size should not exceed 30 MB. Participants register yourselves with mediabang. Look for creators menu and upload your manga comics or illustrations. Provide an apt title and tags and publish your work.